Antoine LeCoultre founded his first watch making workshop in 1833. In 1844, he invented the world’s most precise measuring instrument, the Millionomètre. Then, in 1847, he developed a system that eliminated the need for keys to rewind and set watches. His simple and brilliant solution was a pushbutton that activated a lever to change over from one function to the other. Four years later, he was awarded a gold medal for his work on timepiece precision and mechanization at the first Universal Exhibition in London. In 1858, Antoine’s son, Elie LeCoultre, joined the business at age 16. The two of them continued to make watch history. In 1870 LeCoultre manufactured calibers with complications in small series. They were able to master the precision and development new tools. This revolution allowed great strides to be made in the accuracy and dependability of the timepieces. Since that date, the manufacture has created over 500 different calibers with complications, including over 200 chronographs, over 200 repeaters and numerous grand complications. Elie LeCoultre’s son, Jacques-David LeCoultre, took over management of the watch manufacture after three years spent in the workshops as a watchmaker. He was the Director General of LeCoultre & Cie from 1906 until he passed in 1948. In 1903, a Paris watchmaker and French Navy man, Edmond Jaeger, challenged Swiss manufacturers to expand and create the ultra-thin movements that he had invented. Jacques-David LeCoultre, Antoine’s grandson who was responsible for production at LeCoultre & Cie., accepted the challenge, giving rise to a collection of ultra-thin pocket watches, including the thinnest in the world in 1907. It was equipped with the LeCoultre Caliber 145. The collaboration between Jaeger and LeCoultre led to the company being officially renamed Jaeger-LeCoultre in 1937. In 1950, the Manufacture released the Memovox, or the “voice of memory”. Its outstanding mechanism could be used as an alarm for waking up, appointments, timetables, etc. In 1956, a Memovox featuring the Jaeger-LeCoultre Caliber 815 became the first self-winding alarm watch in history. Then, in 1956, the company marked its 125th anniversary by releasing the Memovox Word time. Today, Jaeger-LeCoultre continues to manufacture outstanding timepieces and selling all over the world. 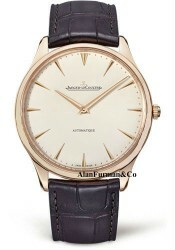 We sell the full line of Jaeger-LeCoultre watches at greatly discounted prices. All Jaeger-LeCoultre watches are new and come with a 2-Year Parts and Labor Warranty.